An Uber passenger died following a collision involving a Prius and a BMW in the Mid-Wilshire area of Los Angeles on Thursday, March 15, 2018. Photo from OnSceneTV. A woman was arrested on suspicion of vehicular manslaughter following a two-car crash Thursday in the Mid-Wilshire area that left another woman dead. 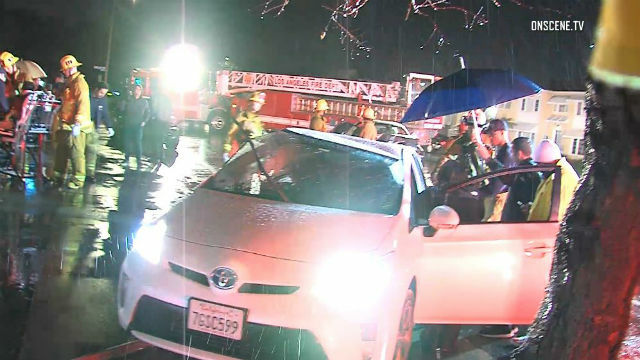 The crash involving a BMW and a Toyota Prius being operated as an Uber vehicle occurred about 1:45 a.m. in the 5700 block of West Olympic Boulevard, according to the Los Angeles Police Department’s West Traffic Division. Investigators said the fatally injured woman, who was in her 20s, was a ride-hailing passenger in the Prius. Coroner’s Assistant Chief Ed Winter said the victim died at a hospital. Authorities withheld her name pending notification of her family. The Toyota was westbound on Olympic Boulevard and was turning when it was hit on the passenger side by the BMW that was eastbound on Olympic Boulevard, the LAPD reported. 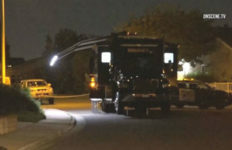 The driver of the BMW, 33-year-old Jillian Junia, was booked on suspicion of vehicular manslaughter, with bail set at $50,000, authorities said.